Nestled in Worthington Ohio a historic marker placed in front of a white house designates the birth place of Roswell Sabin Ripley. The two hundred year old home is located just a block south of the old Worthington Inn. Ripley was born March 14, 1823 and lived here until his family relocated to New York in 1839. Roswell Ripley joined the military and served valiantly during the Mexican-American War. At the conclusion of the Mexican-American, Ripley continued his military service and was stationed in Charleston South Carolina. When the South succeeded from the Union many Northern officers returned home to the North. Ripley would stay in Charleston with his wife and daughter. On December 20, 1860 South Carolina seceded from the Union. A few days later Major Robert Anderson abandoned Fort Moultrie on Sullivan's Island and moved his forces to Fort Sumter in Charleston Harbor. Before leaving Union forces disabled all the artillery and munitions they couldn't remove before Fort Moultrie was abandoned for the more defensible position of Fort Sumter. Roswell Ripley volunteered to repair the artillery as well as bring the fort back into working order. Within months the job was completed and Fort Moultrie was ready for action. Captain Abner Doubleday, who was at Fort Sumter, knew Ripley from the USMA and was aware that Ripley was in command at Fort Moultrie. Doubleday stated in his official report that Ripley ". . . being a man of talent and a skillful artillerist did us a great deal of harm." After the fall of Fort Sumter General Ripley requested reassignment to General Lee's Army of Northern Virginia. He commanded with the same valor and bravery shown in the Mexican-American War. During the battle of Antietam Ripley was wounded in the throat by a union mini ball. The General was sent back to Charleston to heal and then defended both the city and harbor from Northern invasion. With the end of the Civil War Ripley moved to England. The General returned to America in 1881 and made New York his home until his death March 29, 1887. His body was returned to Charleston and was buried in a place of honor in the Magnolia Cemetery. He will forever be know as Charleston's "Gallant Defender". It was a Son of Ohio whose guns fired those first shots in our Civil War and still another Ohio Son who would silence them forever. The Ripley House is privately owned and not open for tours at this time. The first Union shot of the Civil War was fired by Captain Abner Doubleday of baseball fame. Capt. 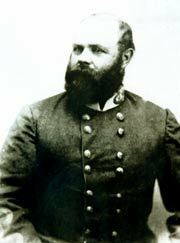 Doubleday was the second senior officer at Fort Sumter, under Major Robert Anderson when the firing started from General Riply's cannons.